Confirming our reservation at the gate, we continued the drive up the hill, passing trails and a greenhouse, a putting green and horse barn before reaching the actual hotel. Made of wood and stone, the building is majestic in an earthy way; its turrets and balconies and chimneys adding to its character. 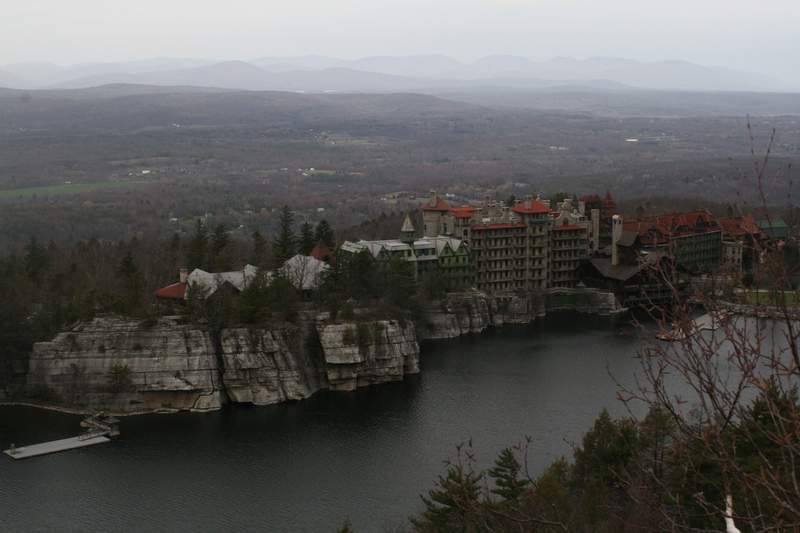 We were staying at Mohonk Mountain House, a resort located in the Hudson Valley near the town of New Paltz, 90 miles north of New York City. 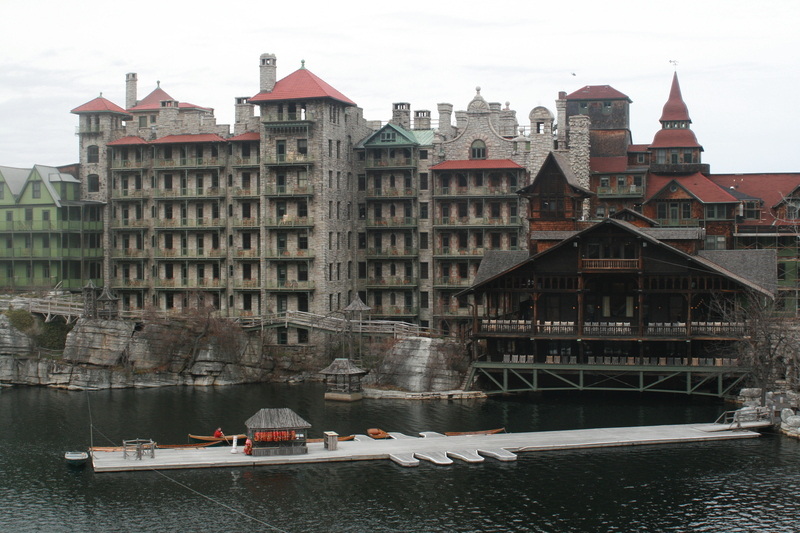 Mohonk Mountain House was first built in 1870 by the Smiley brothers who were excited to find a lake on top of the mountain. They bought the property and immediately built the first rendition of the resort. Future additions eventually increased the number of rooms to over 250 on six floors, most with their own balconies and fireplaces. The building meanders, its unsymmetrical chimneys looking like a child’s Lego-made tower, its height and silhouette reminding me of sand dripped castles at the beach. We left our car and our luggage (I needed two bags to carry all my required gear and clothing) and followed the valet’s directions to the lobby and check-in. Our room was small but charming. With a king size bed, a bureau and desk, a fireplace complete with firestarter and logs, our own private balcony and bath, what more could we need? We got lost in the long hallways with their nooks and uneven floors leading us to stairs and elevators, the spa one direction, the dining room the other. 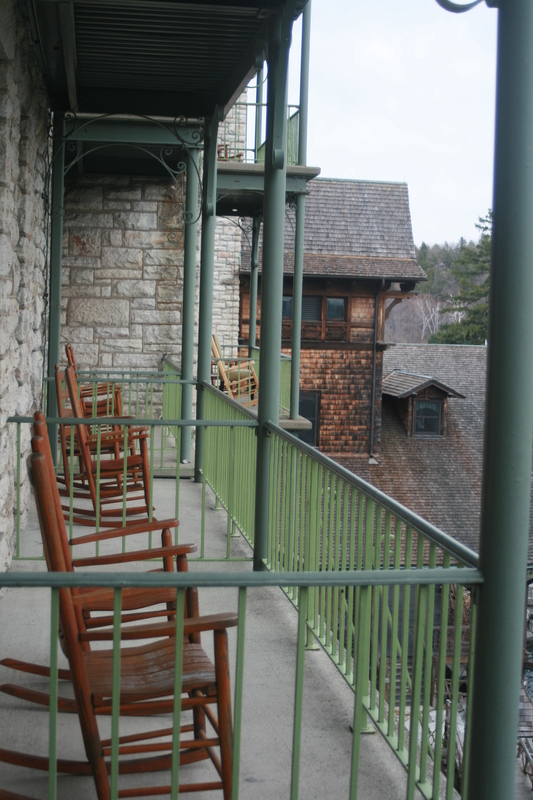 With a rounded glassed-in view of the Catskills, the dining room has several two-person tables along its windows. We sat one table back from the window, still able to enjoy the view, and sampled some of the many options in Friday night’s seafood buffet. Shrimp scampi, clam chowder, bouillabaisse, oysters on the half shell, scallops, and clams as well as beef tenderloin and a chicken curry were available. There were vegetarian, vegan, and gluten-free choices, salads, a dried fruit and cheese platter, and an assortment of desserts. We had a buffet lunch on Saturday and a buffet brunch on Sunday. Saturday night was a sit-down dinner. Besides eating, there were so many things to do. We could row the boats, attend yoga or aerobic sessions, swim in the Olympic size pool, hike the trails, and ride the mountain bikes. For a little more, we could putt the green, ride a horse or get a massage. Summertime adds a beach with swimming, fishing, and other boating options. Winter adds potential cross country skiing and ice skating at its outdoor skating rink with large stone fireplace. As it rained and was in the 40s our only full day, too cool for the winter activities and too warm for the summer ones, we elected to swim laps in the indoor pool before getting a massage and enjoying the outdoor stone mineral bath. Sunday we enjoyed a hike and yoga before brunch and check out. The sun came out too, but it was time to go. We drove away, hoping to return some day for a longer, warmer stay, maybe even with the kids.